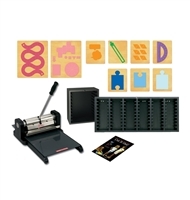 These starter sets offer a machine, a set of dies and enough storage for the dies included. If you don't see a set you're looking for just call us. We'd be happy to help you find exactly what you need. If you do not see the die you want or need assistance to find a specific type of die please call us at 877-434-3288 or contact us at Ellison@completek-12.com.